The nature of British baseball is that players frequently come and go. Steve Robertson and Stuart Carter did not return for the 2002 season. However as if by magic a new wave of recruits arrived. The brothers Kal and Aspi Dimitrov, Rod Naghar, Ivor Luk and Mark Houchin. All were rookies but were enthusiastic to join the Falcons and get playing. Over time in particular the Dimitrovs and Mark would impress with their dedication to the team development both on and off the field. The Falcons had bolstered numbers again, but were still in the situation of having many new players that needed development. The fresh input of the new coach Stuart Boast really helped drive this development. The season’s results were 5 wins and 9 losses. 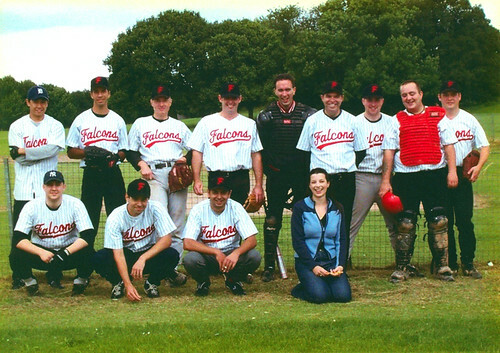 The Falcons took some sound beatings from the Croydon Pirates (9 to 19) and the Milton Keynes Rebels (25 to 9). However they held the Brighton Buccaneers to two tight games before losing. They also comprehensively beat Richmond Knights (33 to 7) and Medway Mariners (18 to 5). A respectable finish. More importantly the team was starting to feel like a unit again. The enthusiasm of the newer members: Cornish, Dimitrov x 2, Houchin and Luk balanced by the old core players: Auchterlounie, Boast, Freeman, Hare, Manning, Oliver, Raybould, Sierocinski. Things were looking up.